Body parts that stain best? How long does henna stain? What makes Henna stain dark? Over 21 years professionally adorning the midwest. There is no event we cannot handle, and no demographic we don't attract! We are always the center of attention at parties and events. Our highly professional crew is fun and personable. With multiple skilled artists on our roster, we have served at events ranging from smaller celebrations and house parties to company functions and large weddings, to celebrations and events numbering in the thousands, such as SXSW, the Freaker's Ball in Dallas, and Radha Madhav Dham, the largest Hindu Temple in the United States. Look through our portfolio, and feel free to contact us with questions. Instant delivery via email or text message. Copyright © 1996-2023 Villafana Enterprises Incorporated dba Mehndi by Marcy aka Marcy Ann Villafaña. All Rights Reserved Worldwide. *All images are protected by copyright & may not be duplicated or reproduced in any media. **All photos are actual works created by Marcy Villafaña. Mehndi by Marcy does not use clip-art, or buy stock photos. *All images are protected by copyright & may not be duplicated or reproduced in any media. **All photos are actualy works created by Marcy Villafana. 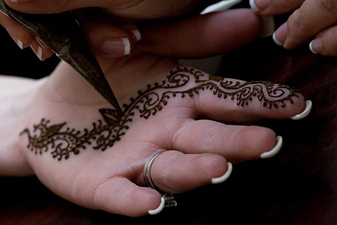 Mehndi by Marcy does not use clip art, or buy stock photos.